A couple of weeks ago, when author John T. Edge was in town to promote his Truck Food Cookbook, I couldn’t help but notice that of the 150 food-truck recipes included, not a single Utah food truck was acknowledged. So, I thought I’d better take care of that. There’s a thriving, bustling food-truck scene here. At least 16 food trucks operate in and around the Wasatch Front, by my last count—not including all the food stands and carts. There may be additional trucks that I’m unaware of. If so, please let me know. The food-truck boom is driven, largely, by economics. In a sense, they are mobile restaurants, but without the overhead a brick-and-mortar eatery requires. As Edge points out in his book, it costs $900,000 to open a Chipotle, and $200,000 for a Subway. By contrast, a used food truck can be had for as little as $10,000. Once you have your truck, there’s no rent to pay, no furniture to buy and relatively few salaries; most food trucks are operated by one to three people. There are fuel and operating costs, of course, but no electricity, heating, water or air-conditioning bills. Food trucks aren’t exactly a risk-free proposition, but the financial risk is substantially less than with a “real” restaurant. The downside, of course, is that they are, literally, moveable feasts. So it’s essential that patrons are able to find their favorite food trucks—hence, the important role of social media. Most food-truck operators keep customers abreast of their whereabouts via Twitter, Facebook and websites. Also, food trucks are at the mercy of Mother Nature. Very few offer any seating or shelter from storms, and a good blizzard or even a hard rain can close down business. Finally, many food trucks are seasonal, operating only in warm weather. Here are the ones I know of currently dishing up food in Utah. It’s summer, so get out and try them. 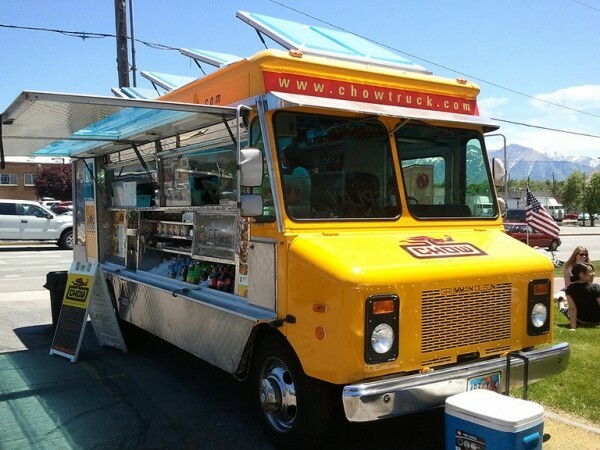 The big daddy of Utah food trucks—and the first that I was aware of in the state—is, of course, SuAn Chow’s Chow Truck (ChowTruck.com). SuAn worked in the restaurant business here, and was the founder of Charlie Chow and ChowMeinia before firing up the Chow Truck. Her menu is eclectic, and ranges from Asian-spiced, flash-fried calamari to unique $3 tacos (panko-fried tofu, coconut-lemongrass chicken, beef with cilantro pesto, etc. ), salads ($5) and sliders ($3). Another truck with an Asian influence is the Bento truck (BentoTruck.com), which travels from Lehi up to Logan, offering Japanese-style bento meals such as yakiniku ($7), beef curry ($6.50), teriyaki chicken ($6), pork gyoza ($6.50) and veggie tempura ($6), along with special seasonal items. Then there is Cruzin Sushi (Twitter.com/CruzinSushi) which—you guessed it—dispenses sushi rolls, along with rice bowls and tempura. The fresh, made-to-order rolls are priced $5 to $9.50, and include spicy snapper (my favorite), tekka maki, dragon roll, yum-yum, unagi maki and a Vegas roll, just to name a few. Italian flavors are well-represented among our local food trucks. One of my favorites is SubMarino’s (Facebook.com/SubMarinosTruck), where Tony Marino dishes up terrific homemade meatball and beef sliders (three for $5), grilled-cheese sandwiches ($4), Italian club sandwiches ($7) and a specialty he calls the “not-so-Philly” steak sandwich ($7). Three mobile pizza units bake up rustic pizzas in wood-fired pizza ovens. There is the Herriman-based Fire & Slice (FireAndSlicePizza.com), which travels to fairs, parties, weddings and more—even offering hands-on cooking classes. And then, Surefire Pizza (SurefirePizza.com) makes individual-size pizzas ($8), including an excellent classic Margherita, pepperoni, sausage and chicken pesto pizzas. Pogi’s Fire-Grilled Pizzas (PogiGrill.com) is often found in the South Valley, and offers personal pizzas ($4.25) like barbecued chicken, Hawaiian, pepperoni and garlic-ranch chicken. I first visited Julie Sheehan’s Torta Truck (801-792-6746) looking for Mexican torta sandwiches. Instead, I discovered the Italian torta rustica, which is not unlike a potpie, loaded with meats, veggies, cheese and such. She also makes a great panini. For Americanized menus, look to Provo’s Happy Food Truck (Facebook.com/HappyFoodTruck), with specialties like the breaded beef sandwich and curly ribbon fries, along with a smattering of Mexican and Argentine items. Beli Gourmet Mobile Kitchen (EatBeli.com) primarily services special events, concerts, festivals and such with an eclectic menu ranging from the Beli “unsandwich” to deconstructed salads (“unsalad”), sloppy Joes and even Korean barbecue beef stroganoff. The Better Burger Truck (BetterBurgerTruck.com) is another of my favorites. It features grass-fed beef burgers, all-natural turkey burgers and veggie burgers created by Ian Brandt of Sage’s Cafe and Vertical Diner, all served up on first-rate Stoneground Bakery buns ($6.50 to $7). Smokestream (SmokedStream.com) isn’t exactly a food truck; it’s a food trailer. Based in Bountiful, Smoke Stream serves top-notch barbecue from a customized Airstream “Silver Bullet” trailer. They do barbecued brisket, pulled pork and ribs, along with sides like baked beans and cornbread. Looking for Latin flavors? For Peruvian fare, head to Como Lomo (801-450-6637, http://on.fb.me/MEIxIx). It’s there you’ll find delicious items like lomo and pollo saltado, aji de gallina ($6 to $7) and equally tasty Peruvian sandwiches (chicken or steak). Of course, you’ll want to finish up with something sweet. So I’d recommend Crepes on a Roll (801-759-2573), with dessert crepe options like Nutella, banana, apple, caramel, apricot, strawberries, whipped cream and more ($5). They also make savory crepes like the Monte Cristo, roast beef, turkey and Greek. Or, you can pig out on cupcakes and ice cream at the SoCupcake truck (SoCupcake.com). Regular cupcakes in flavors like red velvet and carrot cake are $2.50 for regular size or $1.25 for minis. This just in: As we were going to press, I learned of a brand-new food truck, which launched this week: Charlie and Oliver Lewis’ Lewis Bros. Food Truck (Twitter.com/LewisBrosFoodTruck). So, with all that tempting food motoring around out there, you’d better get truckin’!